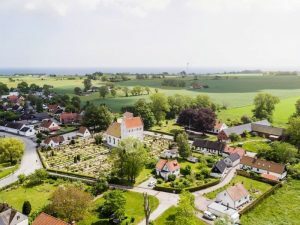 In the rural town of Simris in the South of Sweden, E.ON, a large European utility company, has been testing the islanding of a 100 percent renewable microgrid. Remote areas of Northern Scandinavia experience harsh winter storms, with falling trees causing damage to overhead power lines, resulting in power outages. Reliable microgrids that can quickly switch to island mode in these situations will increase resilience. Once every five weeks, the 150 customers of Simris take part in an experiment. The community turns into a power island, relying on the privately owned 500 kW of wind and 442 kW of solar generation capacity, as well as the 800-kW battery installed by E.ON and a back-up renewable fuel generator. Simris will be operating off-grid this week, live data can be viewed here. Residents in Simris have reliable power and were understandably concerned that this trial would jeopardize the supply. It was important for E.ON to maintain a good relationship and keep customers informed about testing schedules. “If there are problems, we will have power restored within 30 seconds because we can just reconnect to the main grid,” explained Mike Hirst, electrical engineer at E.ON. “It would only take one outage on our part before everyone turned against us. We’re very conscious that we don’t want to do anything to disrupt power,” Hirst said. Following a bumpy battery commissioning journey, testing has been successful with no major issues encountered, aside from mice unexpectedly chewing through cables in the battery system. Luckily they chose the 24-V signal cables rather than the nearby 400-V cables, resulting less harm to themselves and the project. Everything is now sealed off with metal mesh; a useful lesson for future projects. Simris now forms a part of the $26 million InterFlex project. Funded by Horizon 2020, it sits within the European Union’s biggest research and innovation program ever. 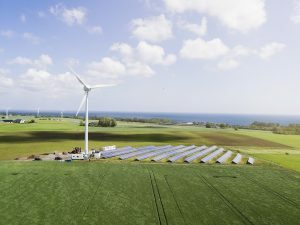 The project will run until the end of 2019, and aims to provide deep insight into six innovation streams: islanding, demand response, energy storage, cross energy carrier synergies, electric vehicles, and grid automation. Having successfully demonstrated the islanding capabilities, Simris will now integrate demand response technologies into the microgrid. The ideal scenario is to run continuously in island mode without using the backup generator. This is possible when there is an abundance of wind and solar energy, which can be stored in the battery for later use. The last trial ran for three days continuously without reliance on the generator, but in the winter the battery only runs for around an hour and a half before the generator is needed. A larger industrial battery is one way to work towards this ideal scenario. The other way is to integrate domestic solar and battery systems into the microgrid. E.ON now offers residential customers significant discounts on these systems, as well as heat pumps, to help determine the right mix of industrial and domestic participation from a technical and commercial perspective. In conventional power systems, the generators have inertia due to the heavy rotating equipment. If a generator unexpectedly trips off, the equipment will continue to rotate due to the high inertia, eventually coming to a stop. This lag gives backup systems time to kick in before the imbalance between supply and demand significantly impacts the frequency. “There are a lot of views that grid need inertia, we’re running ours with zero,” Hirst explained. In a system with low inertia, the frequency will drop rapidly and back-up systems have to react instantaneously. The Simris system has zero inertia when islanded from the grid, so the controls systems must quickly manage the system frequency in reaction to any changes in power generation. Reduced inertia is one of the issues faced as more renewables come online. This renewable microgrid has demonstrated, albeit on a small scale, that it is possible to operate with zero inertia. 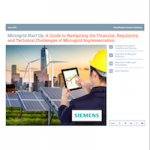 Interested in renewable microgrid projects? Read more stories on the topic here.